Shelly Rofkar: It is very much like the basket weaving, it’s got the weavers (vertical threads) and it’s got the wefts (horizontal threads) . . . But there’s no weight, nothing is under tension like a regular loom has all of your warps are under tension and you manipulate the warps and you have a shuttle that goes through. There is nothing like that everything just hangs loose . . . Everything is done with your hands, so it’s two strand twining like the basketry. The nice thing about chilkat, which is different in process than basket weaving or raven’s tale weaving or Northwest geometric . . . with raven’s tale, what you do is you plan it all out, it’s very regimented . . . With chilkat you don’t do that. You can go back and forth, it’s kinda like painting with wool. So, it kinda gives you more freedom to do multicolored pieces, like I would take this blue and go back and forth, and back and forth, or the yellow and back and forth. Teri Rofkar: Formline [as it is called] . . . I go into the museums and see these great pieces that were cut apart intentionally [during potlatch] and given out and then they are repurposed to some really cool pieces . . . 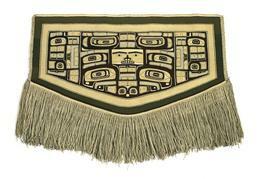 But that is something that isn’t done now and I think again it’s that kinda of how important these [chilkat] pieces were even as they became too old . . . Audience: How long does it take to complete a robe? Teri Rofkar: We both have different answers to that, I have done a robe in as fast as 800 hours, but I have also taken over 2000 hours to do a raven’s tail style robe . . . [which] did not include the spinning. Shelly Laws: And the spinning is a large piece of time. When I’m spinning leg spun, when I’m doing warps if I’m really moving and nobody needs me for anything I can do ten yards in an hour . . . but, a robe will take about a thousand yards so that’s a lot of time just in the warp. And, then you have to spin the weft and then you have to dye the weft. . . . [It takes] months to get the materials together . . . But, if the robe is more complex it will of course take longer, you know if you want to weave a tiny robe like we saw in the museum it would probably be pretty quick. It’s hard to say probably now I can maybe weave a robe including the materials in a couple of years maybe a year and a half, I would think. Shelly Laws: [The] diving whale pattern — it’s been done many times, sometimes the pattern board were done over and over. They’d paint the pattern board and the weaver would look at the pattern board and weave it . People usually first look at that face [in the middle] and say “oh it’s a human” well, most of the formline or the chilkat pieces have this human looking face in it and it is representational of the spirit of whatever the creature is. So, in a lot of the Native stories, like the story about the bear or something, where the bear takes their skin off and there’s a person inside — the spirit person inside. This [face] represents that spirit, where they take their skin off and it’s the person inside. So, usually it’s in the center of the animal, or whatever creature it is they have on there, and it’s just a human face . . .
With chilkat quite often they would have a center pattern and the side patterns and they would be different animals. Usually, the center would be like a house crest, or a story, or a situation, and then the sides would more be your clan crest . . .
On most sides of chilkats you will see at the bottom what they call the side braid, which is a very fun thing to weave. It’s a signature — if you look at the old robes [they] have that signature too and each weaver when she did, or he did, but generally it was a she that did the robe they would sign it. They would put a different color grouping there. Shelly Laws: I’ll spin it, and I’ll weave it, and it still doesn’t look the same, and as good as in the museums, and I finally have come to realize that it is the material. Because they used mountain goat and I use merino, which is pretty darn nice fiber, very fine . . . I was thinking that at one time the science was embedded in there [the weaving], I mean when you get the mountain goat I know where they are, I know what they are eating. I know so much about them in order to harvest that much. . . . Like the one gentlemen said “well, we would hunt the billies in the spring” . . . But it was afterwards that we found that the billies shed out first and once that wool is released it’s easy to pull off . . . [otherwise] they’re very attached to their wool . Teri Rofkar: By law hunting season for goats right now is August through the fifteenth of December. Just about all of that time they don’t even have wool . . .
Shelly Laws: But if you get them in the spring and you comb them, just that under stuff [which is what you use] sheds right out and you are left with all the guard hair still stuck to the hide. And it is wonderful. Shelly Laws: In the old robes in the museums quite often what you would see is the yellow, and the brown, and not blue, in the really old ones you would see the green. Blue was very popular on most of the newer robes, most of the post-contact robes, because I think originally they started boiling it out of some of the old wool blankets that they would get and then I’m sure they would get dyes as soon as they could and then they moved into commercial yarn which usually helps you identify ages and maybe, you know technique of how things were done. But in the old ones it was green and it is a copper dye . . . The yellow is from the wolf moss . . .
Teri Rofkar: And the brown was originally hemlock bark, it’s the outer bark of the hemlock. Shelly Laws: Anyway . . . the color would go away and a lot of the old robes you would look at it and go “was it white or was it yellow?” The yellow was just not stable. So you see a lot of those center faces that would have had maybe green or yellow and they are all white, but you can see that there was another color in there. The black seems to hold up pretty well, however I think they used to put some iron in there . . . so it made it a little less stable as far as the fiber, sometimes in making the dye I think the black got a little bit more brittle and sometimes you would see the black, in some museum pieces tends to be the stuff that has more missing out of it or more broken pieces or more eaten up and I think that part of that might be from the dye process. But the green, the copper seems to hold up pretty well. Shelly Laws: When you think about it the Tlingit people they say we didn’t have a written language, I mean, it was oral culture and everything was remember and then there was the time of contact and so much was forgotten or forcefully forgotten . . . but if you think about the Tlingit people they wrote on everything. The written language is on the spoons, it’s on the clothes . . . It was on everything . . . I would like to call it written history, because everything had decorations. Everything had some piece of information on it.